This 17 inch rotary marble floor brush is made from 100% white tampico bristles, and is naturally acid resistant. That makes it the ideal choice for polishing marble! The brush can actually be used with any of our 17 inch buffers, but it works best with the marble machine because of it's 150 pound frame. The more weight adds more friction on the floor, producing a higher shine to your marble or stone. 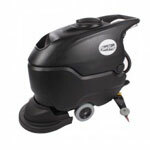 Can also be used as a weekly cleaning device for typical maintenance.